Our reviews will help you decide upon the best Chronos chess clock for your needs. Chronos is perhaps the most well known brand name in the chess clock industry, and for good reason. They make great products. There are few serious chess players out there who haven’t used, known someone who’s used, or heard of Chronos chess clocks before. Because of their quality and reliability, they are very popular and widely used – you can see them in use at just about any chess tournament anywhere across the country. This is because, when you buy from Chronos, you can virtually guarantee yourself a great, high quality product that works well. But if you’re wondering which of Chronos’s chess clocks are the absolute best, then you’ve come to the right place. Forget about combing through pages upon pages of product listings and customer reviews, we’ll cut straight to the chase and simply deliver the information that you want to know. In this article, we’ve reviewed and ranked each Chronos chess clock to bring you a list of the cream of the crop, the best of the best chess clocks from Chronos. Read on to find out which clocks made the cut and which didn’t live up to our rigorous reviewing standards. Of course, we have the Chronos Digital Game Clock. 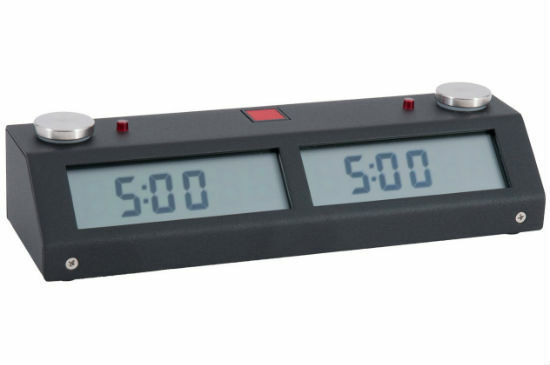 This product is, hands down, the best chess clock that Chronos makes, and one of the most reliable chess clocks available anywhere in 2019. It’s a great choice for chess players of any skill or experience level who want to have access to all of the features that a cutting edge digital Chronos chess clock can offer, of which there are many. The Chronos Digital Game Clock has over 70 pre-programmed time controls, as well as the ability to store up to 12 more user programmed ones. It has several different modes, such as beep-at-end, beep-at-time-control, and LEDs on. You can even alter the pitch of the beep sound. This chess clock has pre-programmed modes that let you play five minute chess, chess andante, chess byo-yomi, chess hour glass, chess progressive, GO Japanese byo-yomi, GO adante byo-yomi, GO progressive byo-yomi, GO Canadian byo-yomi, GO Ing byo-yomi, FIDE, count down, count up, Adagio, sudden death, Adante, sudden death and delay, delay with move counter, count down and delay, Shogi, and shuffle chess, just to name a few- and it does all of this on three AA batteries, which are included with your purchase. The durability of this Chronos chess clock is also unmatched. Its sturdy metal frame and rugged enamel finish will hold up and look great for years to come, even if it suffers several falls and dings at the hands of a not so careful owner. This durability makes the Chronos digital game clock a great choice to buy for young chess players who are just getting started. It’s virtually indestructible, so they’ll be able to use it now and keep it for years, getting more and more out of its extended functionality as they grow as players. There are two button versions and several colors to choose from, but whatever you choose, we recommend buying it with the protective carrying case for easy transport. The Chronos GX Digital Game Clock is kind of the “little brother” of the original Chronos Digital Game Clock, but it has a lot to offer as well. It is the same quality chess clock with a simplified interface. If you’re someone who looks at the 70+ pre-programmed time modes that the Chronos Digital Game Clock has and thinks, “when am I ever going to use all of those?” then The Chronos GX Chess Clock may be the perfect fit for you. Because of its paired down functionality, it’s a lot easier to get set up with The Chronos GX Digital Game Clock. You don’t need to waste time reading a 67 page users manual, you can just take it right out of the box and be ready to go! This clock features 4 preset blitz timers and 8 different tournament controls. The idea of this clock is to include only the most popular and widely used timing modes to make the clock simple to use without people missing out on anything that they really need. The Chronos GX Digital Game Clock offers chess players everything that they need, and nothing more, which provides a lot of functionality without making you feel overwhelmed. Once again, this clock comes with your choice of touch buttons or push buttons, and in two different colors We recommend you buy it with the optional carrying bag for ease of transport. Though the Chronos chess clocks are some of the most popular digital chess clocks in 2019, you may be in the market for something a bit different. If none of these Chronos clocks strike your fancy, don’t worry because there is a whole world of chess clocks out there for you- both digital and analog. If you’re still on the hunt for your perfect chess clock, check out our other articles on the subject, like our list of the best digital chess clocks of 2019, or our overview page with the best chess clocks in general. Unfortunately, we can’t help you with a phone number. We recommend you to contact a chess shop in your area. You can always read our Chess Stores Reviews and choose your favorite store.